Offering group exercise classes in Surry Hills, Hiscoes run thirty fitness classes per week including: Yoga, Pilates, Spin, BodyPump, Step and Boxing. Classes run 7 days a week. Full class descriptions below – book a FREE CLASS Looking for more of a challenge?, try Hiscoes HIIT Team Training! Or for more personalised training, check out Small Group Training Check out the Membership options! 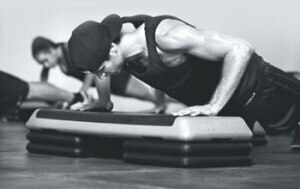 You will sculpt, tone and strengthen your entire body, fast. BODYPUMP™ is one of the world’s fastest ways to get in shape as it challenges all of your major muscle groups while you squat, press, lift and curl. The authentic 1980s freestyle aerobic workout! Focus: Full body workout, focused on toning & is loads of FUN. Inspired by the original VHS workouts made famous by Retro fitness queens such as Jane Fonda, Denise Austin, Patti Sorenson and Cher, founder Shannon Dooley fuses the iconic moves from the classic era with her own unique retro-styled choreography, and smashes them out to a soundtrack of 12 classic ‘80s grooves that changes every week to keep you on your toes. The result? Litres of sweat, loads of laughter, buns of steel and a core to die for. This class is free for Hiscoes members but please email Shannon to secure your spot. Glove up for a skill based class using the heavy bags and partner work with pads. Simple punching combinations and cardio drills, also including body weight conditioning exercises to build strength, power and endurance. In this class you will learning everything from how to stand, how to hold your hands, how to punch and counter punch. Cost is $15 per session for Hiscoes members and $25 for non-members. For more information about Euro-School of Boxing see Hiscoes Programs. For more information about coach Istvan check out our trainer profiles. A fantastic heart-pumping workout. Taught on a stationary bike you will climb, sprint, and train your way through 45 mins to great music and instruction. 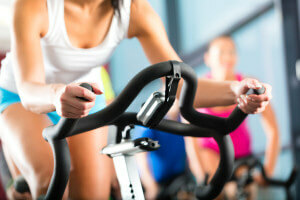 Get ready to get sweaty in Spin and enjoy the ride. No coordination necessary! An interval training exercise class consisting of high-rep and low weight strength training, body-weight exercises and cardio interval bursts, suitable for all levels. This high-powered workout offers participants the latest in step choreography. Mambos, pivots, hop-turns and double dutch-repeaters. You’ve always loved step? Hiscoes still has it. A series of mat-work exercises based on the work of Joseph Pilates aimed at strengthening and lengthening muscles with a focus on the body core. Get ready to transform into a new, more balanced, straighter you. A traditional Hatha yoga class integrating postures, breathing exercises, relaxation and meditation to harmonize you on every level – body, mind and spirit. Stretch and strengthen your body and calm your mind. In Power Yoga Classes a more dynamic style of yoga is offered, combining movement and breath in powerful sequences, designed to help you release the everyday stresses of life. Open to all levels, beginners will be offered simpler modifications whilst those more experienced will be able to explore their practice deeper.